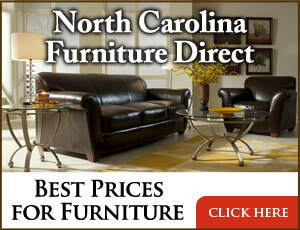 It’s great to be here to share some new interior design ideas with all of you! I’m happy to add some beautiful and inspiring kitchens, living rooms, bathrooms, bedrooms, many interiors featuring different styles. So, hopefully you will find something you really like around here! Pin your favorite interiors and have a great time, my friends! White Kitchen with Pecky Cypress cabinets painted in Benjamin Moore OC-17 White Dove. Countertops are Macaubus Quartzite. Similar kitchen runner can be found here & here. Hardware: Brushed Brass Knobs. Brushed Brass Pulls. Backsplash is Eveningstar Thassos, blue Celeste, and Azul Macaubas marble tile by Tilebar. Cabinet paint color is Benjamin Moore 2047-10 Forest Green. 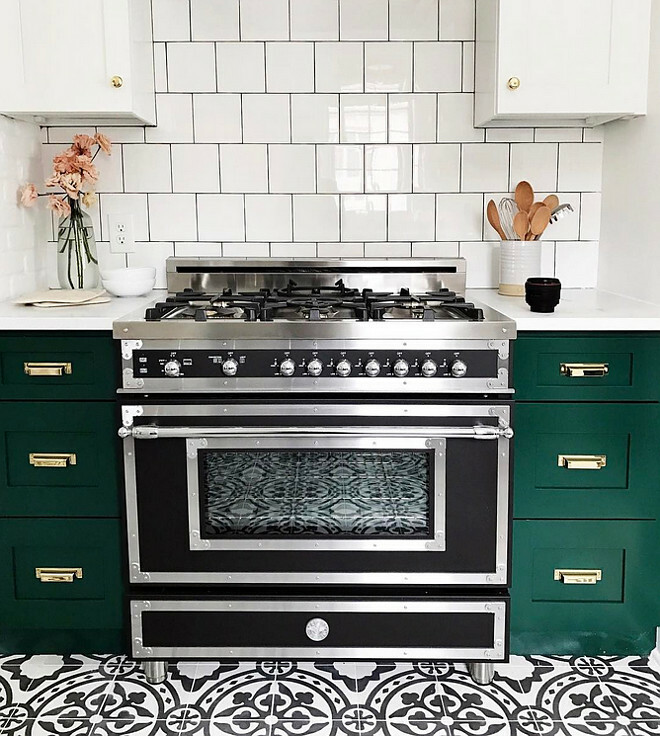 Cement tile is from Cement Tile Shop (similar can be found here). Similar Sconces can be found here. 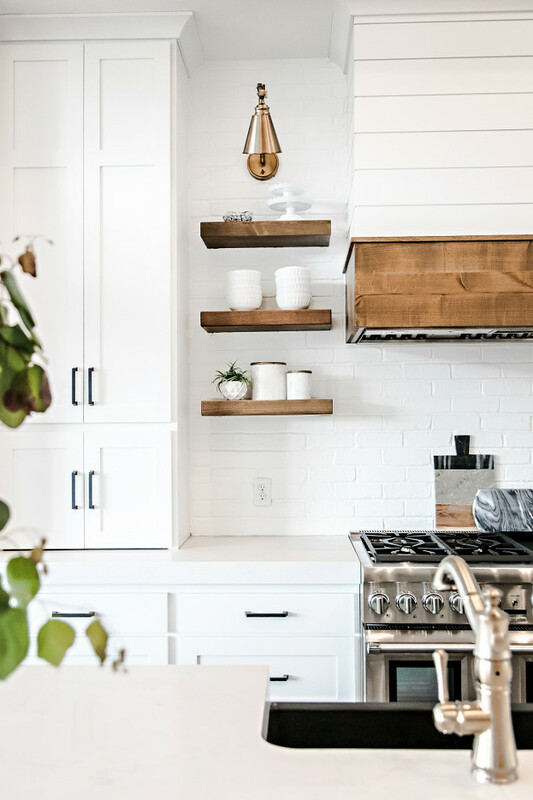 Modern farmhouse kitchen with chunky floating shelves and 4×4 white tile backsplash. Kitchen island with four seating and corner nook with built-in banquette. 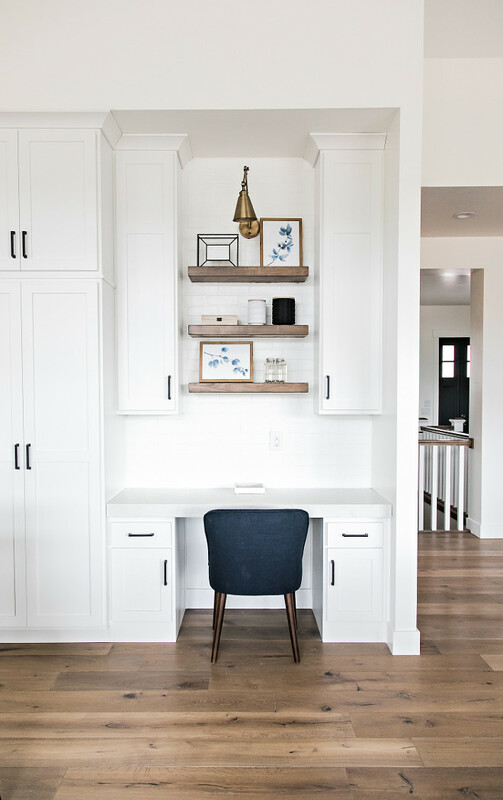 The clients for this kitchen have 3 small children and wanted a family-friendly space where their kids and friends could hang out, complete homework, etc. 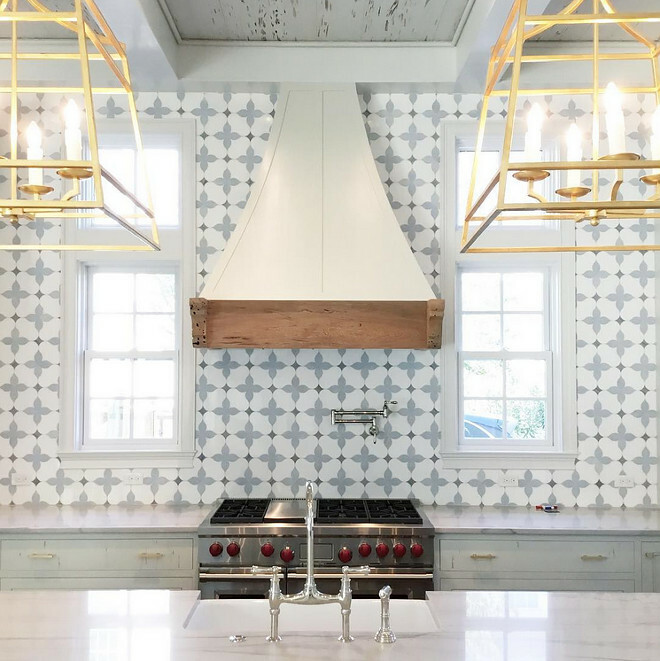 Clients wanted kid friendly but a very “grown up” looking kitchen, so we added the herringbone marble backsplash, capiz chandelier and glass pendants. All of the fabrics used are indoor/outdoor for easy cleaning. Similar Counterstools: Here & Here. 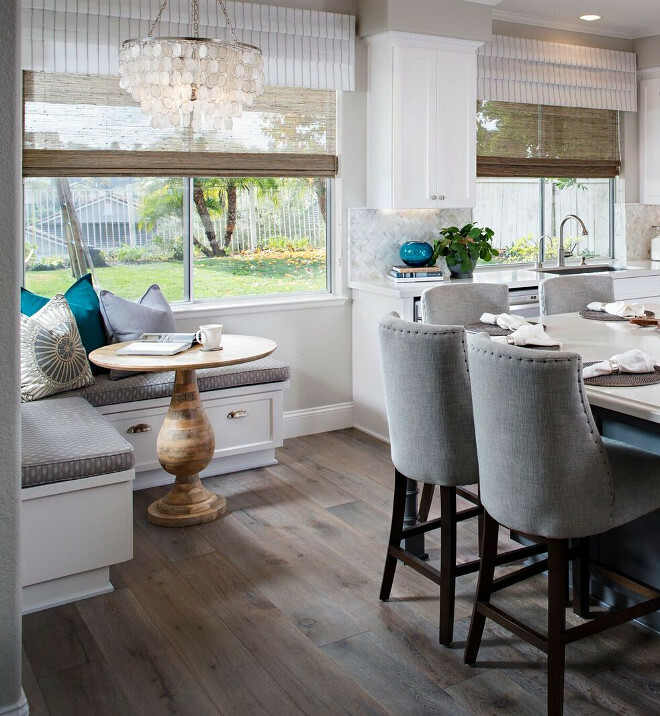 The clients spend most of their time in the kitchen, so by creating the breakfast nook and providing ample bar seating it made the space much more comfortable. Paint is Dunn Edwards White Heat. 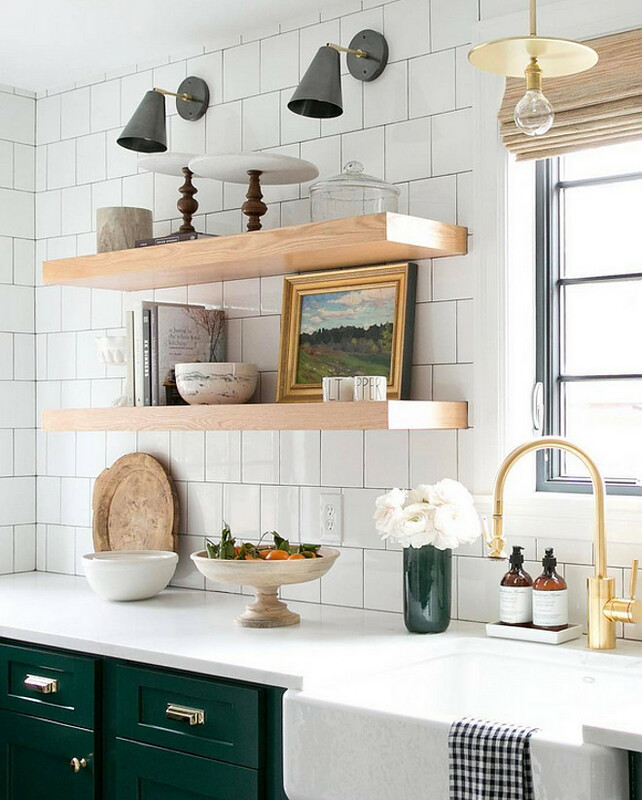 The herringbone marble backsplash is from Wayfair. 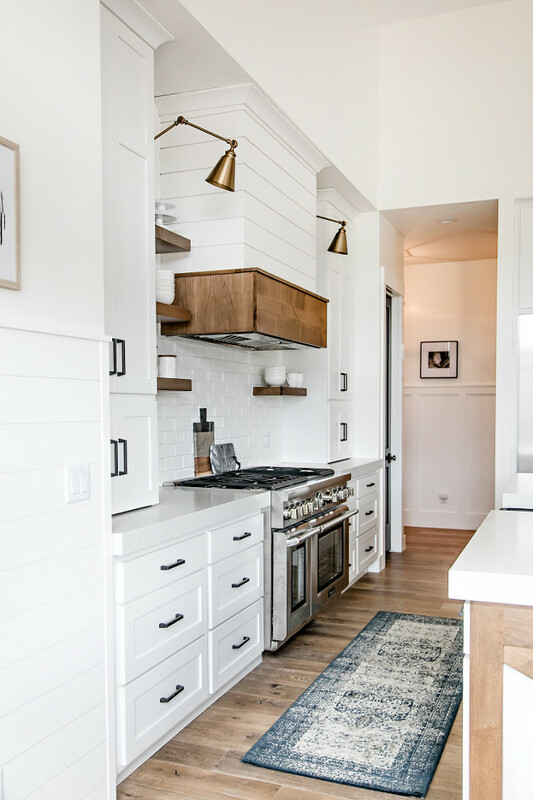 White farmhouse kitchen with reclaimed wood pantry door and zinc hood. The custom zinc hood is by Fine Design Fabrication. The custom Barn wood pantry door is Karten’s Case. Similar barstools can be found here & here. Faucet, prep sink and pot filler: Waterstone Kitchen Faucet – Waterstone Pot Filler. Hardware: Top Knobs Pulls, Knobs & Bin Pulls. 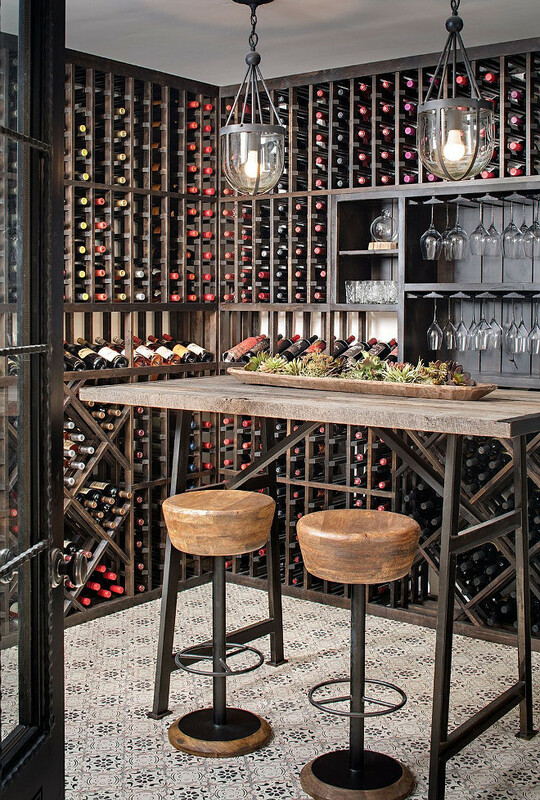 Beautiful Industrial-farmhouse wine room with patterned tile. 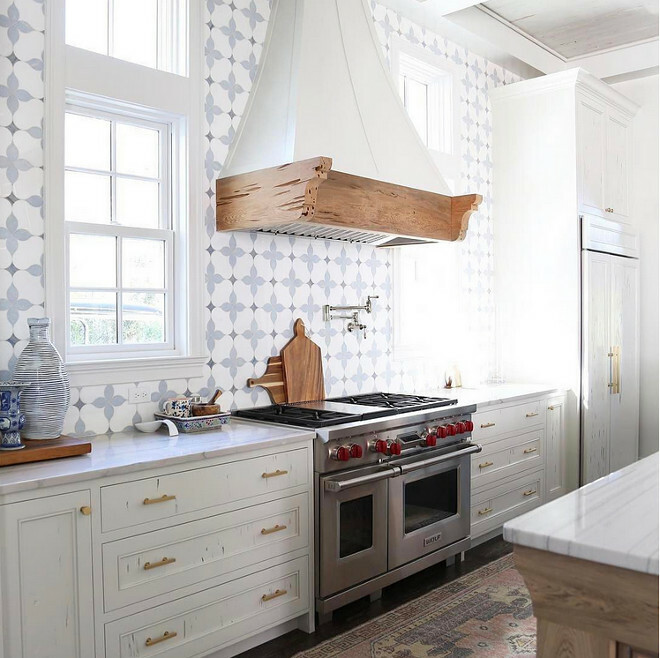 The patterned tile is Mediterranean 26 tile​ from Tabarka Studio​. 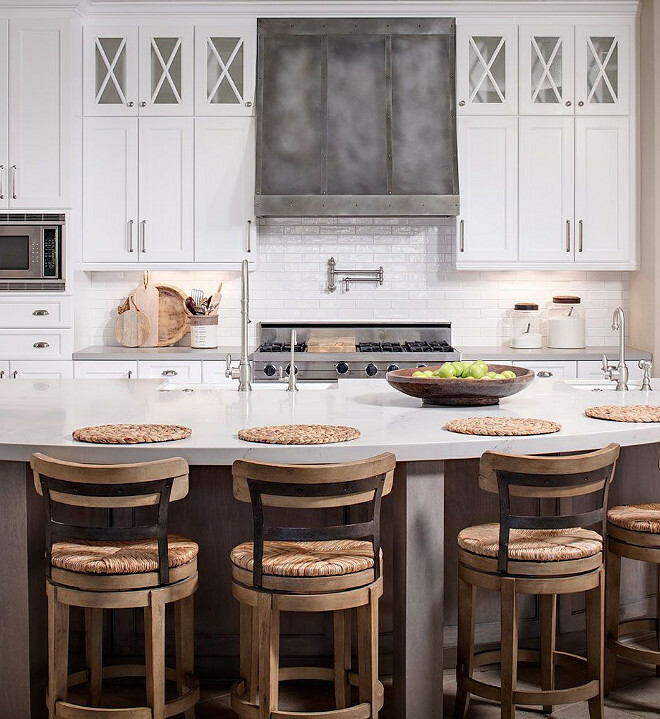 Barstools​ are Caymus Bar Stools from Arteriors. 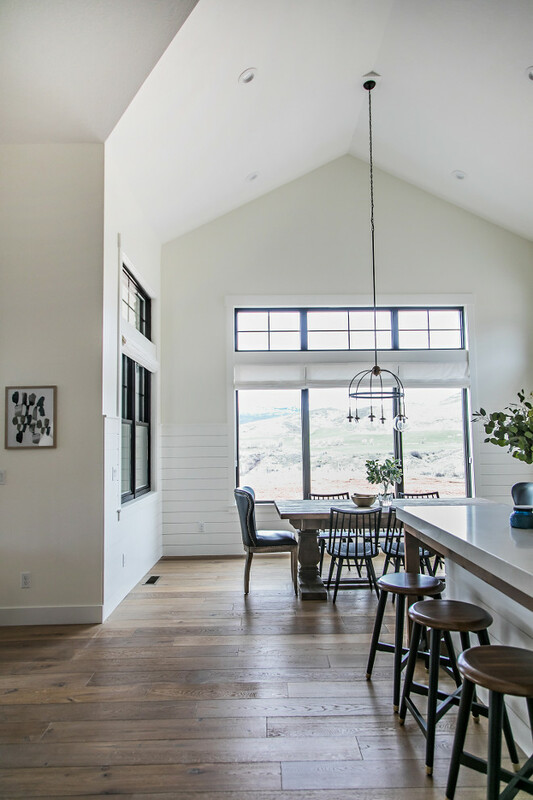 Pendants​ are Clifton Pendant from Currey and Company. Table​ is custom made. 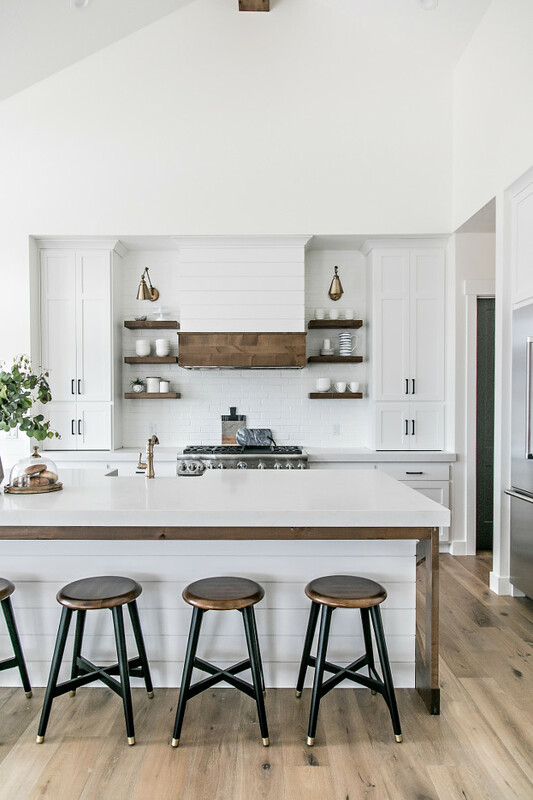 Beautiful, newly-designed crisp white farmhouse kitchen with shiplap hood and brick backsplash. 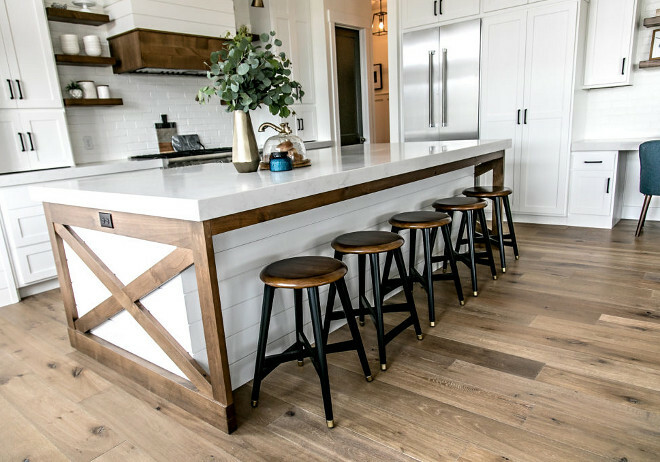 Two-toned Kitchen Island Design: “The design of the kitchen centered around my desire to have a two toned island. I designed the island to have a center base, with shiplap detail. I wanted that section of the island to be painted white. It was important to me to add some stained wood into the design of the kitchen to add warmth. 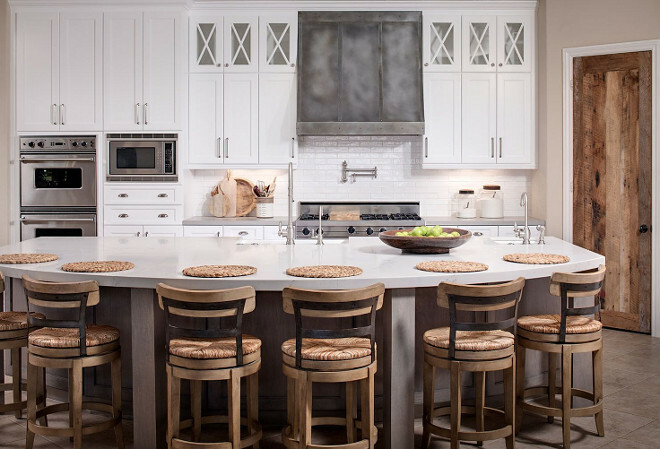 One way I did this was to accent the island with stained “X” end panels.” –Sita Montgomery Interiors. 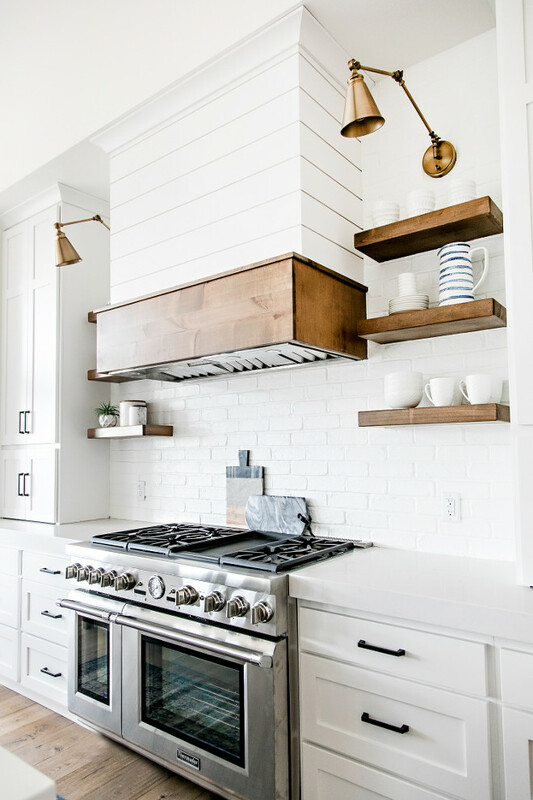 “The white shiplap kitchen hood got a dose of stained wood and the open shelving was made of stained wood as well.” – Sita Montgomery Interiors. 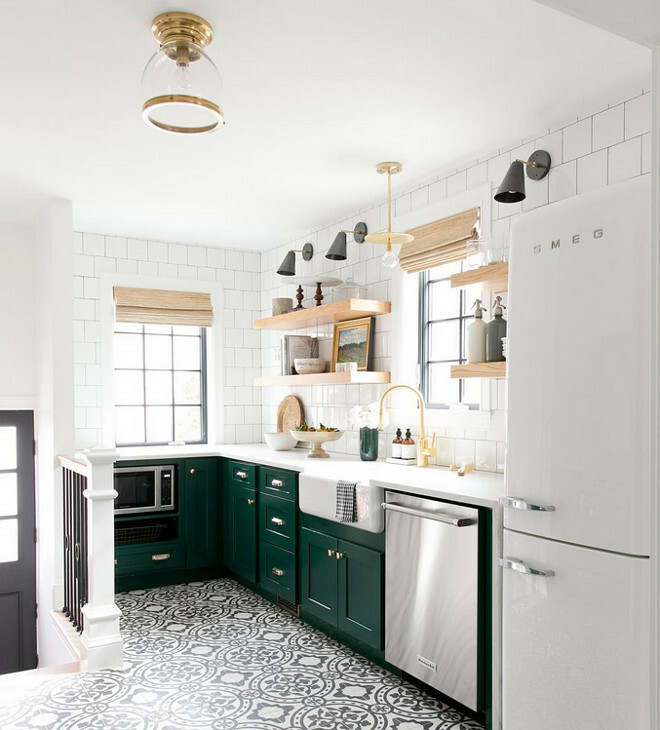 Backsplash: Painted Brick – similar here. The kitchen runner is the Journey Wool Rug by Loloi Rugs. Sconces are Savoy House Morland Warm Brass One-Light Sconce. 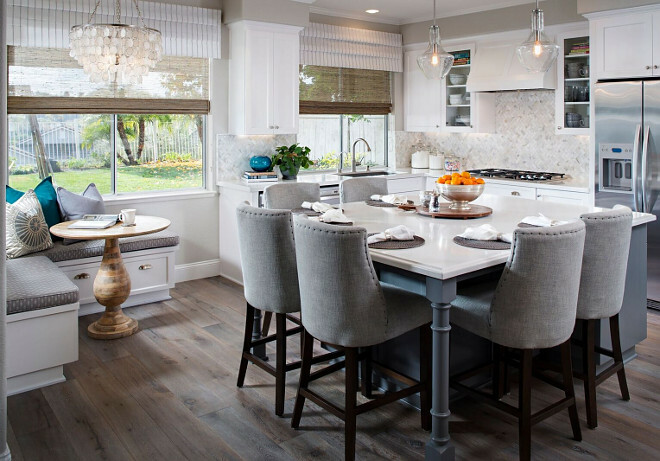 Kitchen Island Elements: “I topped the kitchen off with gorgeous, easy to maintain, marble look, quartz countertops. We used an extra thick 6cm quartz, with a mitered edge, to give the countertops a substantial look. 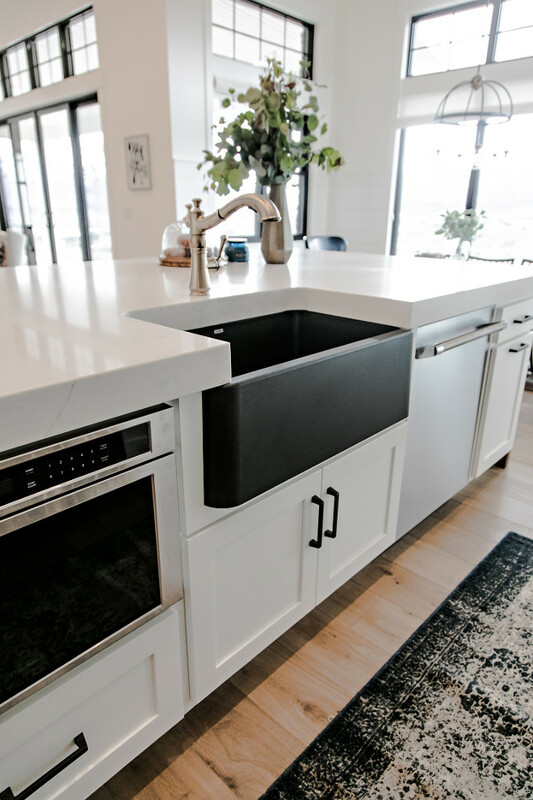 My favorite feature may be the black silgranit, farmhouse sink from Blanco. 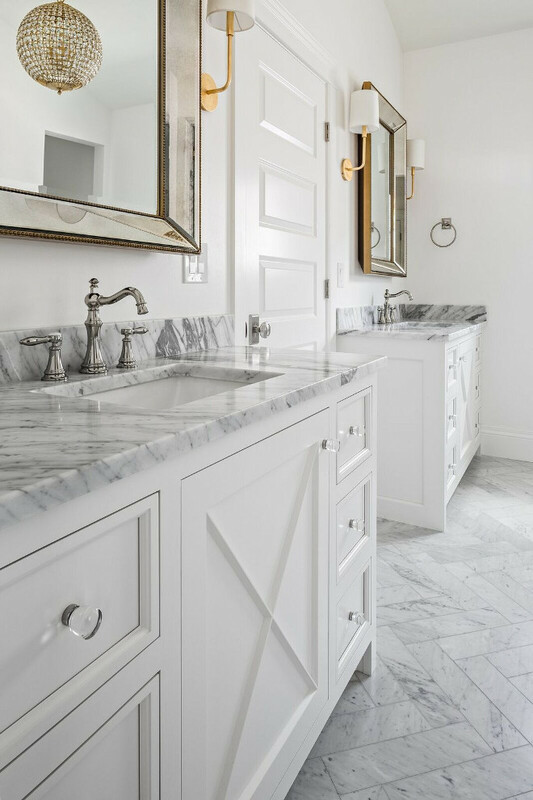 The black sink, with brass faucet, set against the white countertops and cabinetry is an absolute showstopper!” –Sita Montgomery Interiors. The matte black hardware provides a bold contrast against the white cabinet. Hardware is from Amerock Hardware. Desk chair can be found here. 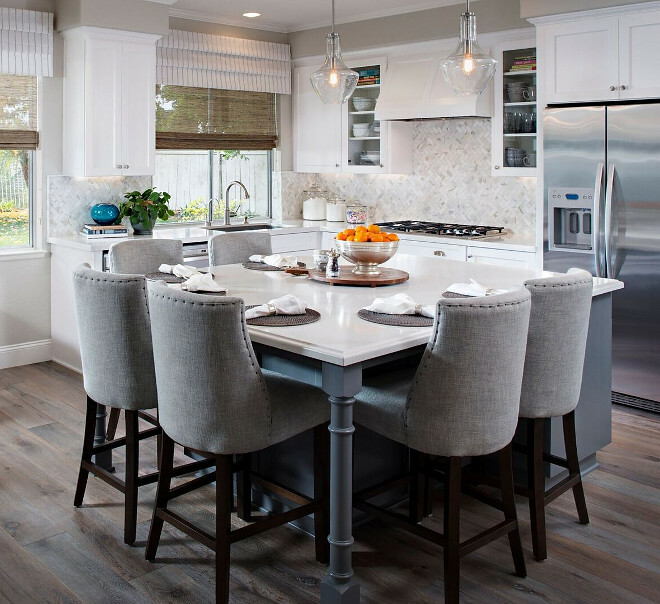 Flooring is Hallmark Floors Alta Vista Malibu – similar here & here. 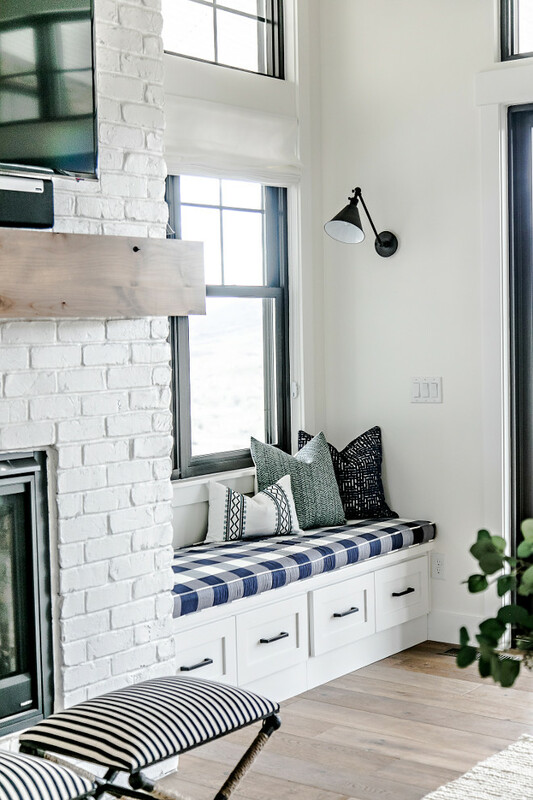 Farmhouse Dining Nook: “The dining nook is the perfect spot for my clients’ family to sit and enjoy a meal or for the kids to do their homework. 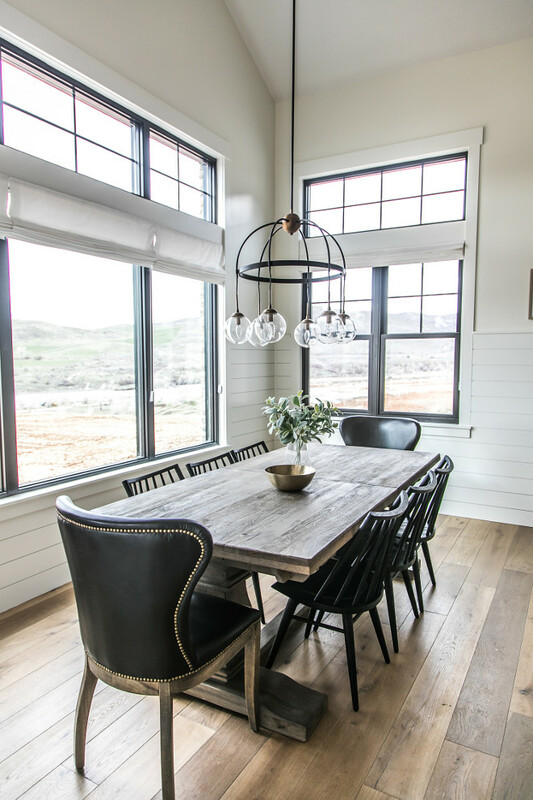 The nook is surrounded by beautiful large windows, which showcase the breathtaking views of the Utah mountains.” -Sita Montgomery Interiors. Lighting is Savoy House Fulton English Bronze and Warm Brass Six-Light Chandelier. 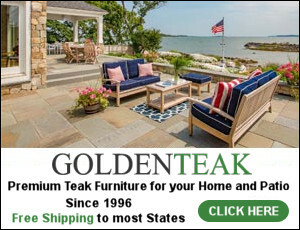 Dining table: here or here (Pottery Barn). 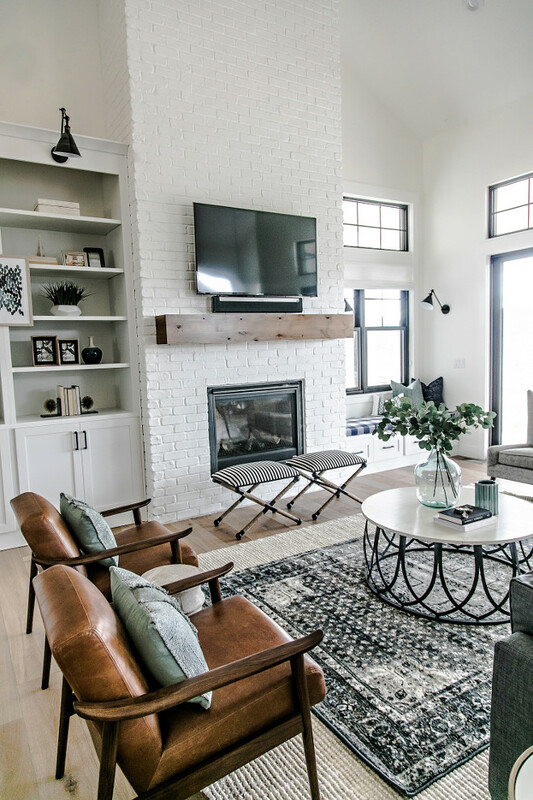 According to the designer, “the painted brick fireplace is the focal point of the family room. 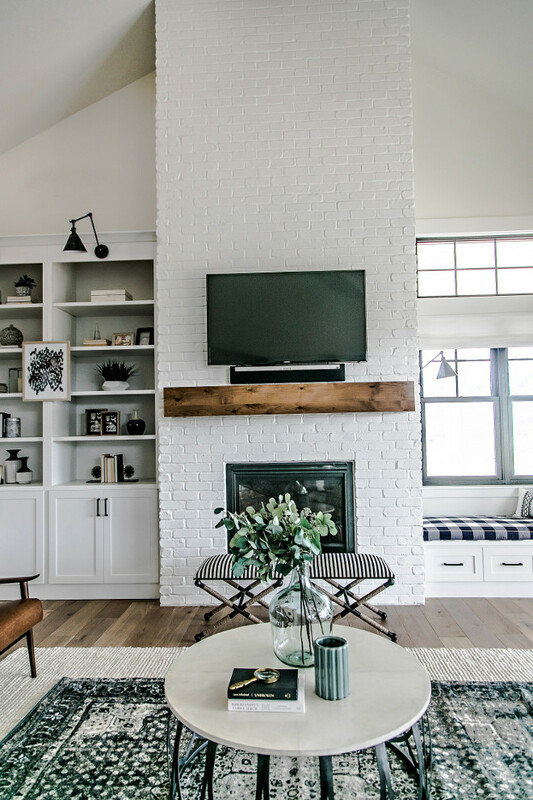 Warmth was introduced into the space with the addition of a custom made white oak mantel. The mantel was given a custom stain, which compliments the other wood tones in the home. The cushion was custom made by the designer’s fabricator. The fabric is from Robert Allen. Arched foyer with double wood front doors with draperies, dark hardwood floors and exposed ceiling beams. Bench and chandelier is Gabby Home. Mirror can be found here. 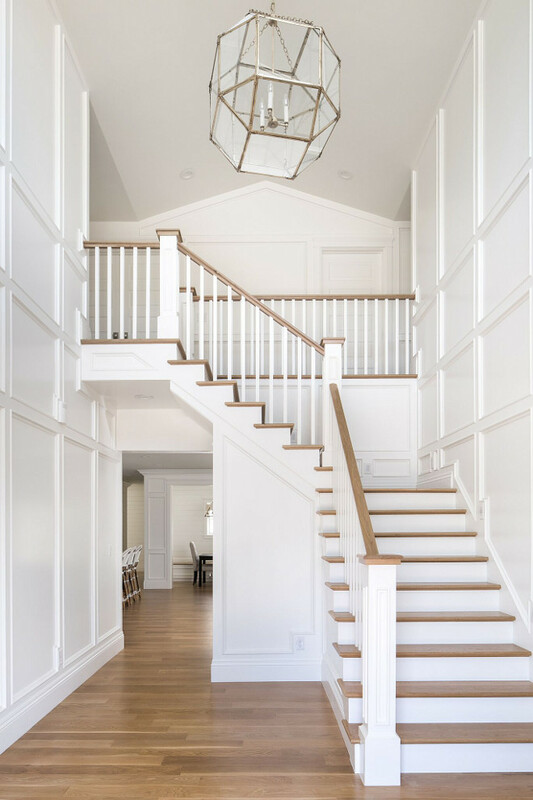 Crisp White Paneling Paint Color: Benjamin Moore OC-117 Simply White. 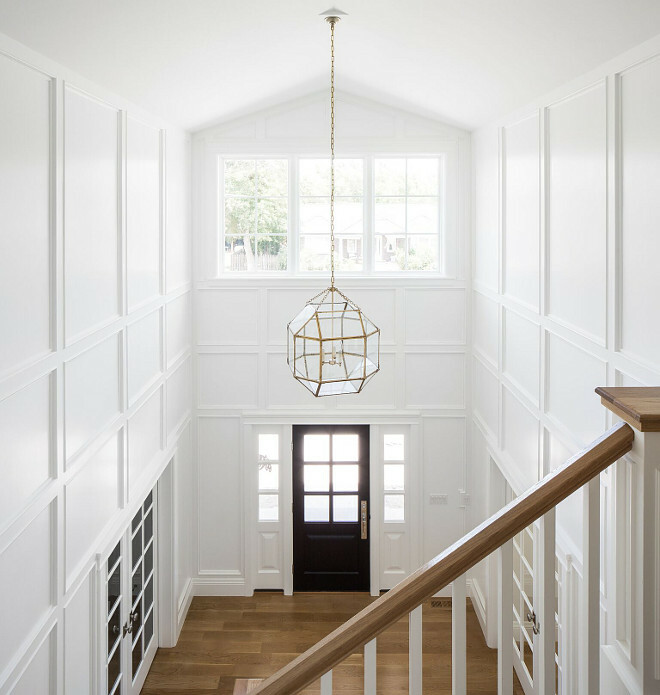 White foyer paneling painted in Simply White by Benjamin Moore and black front door. Lighting is Suzanne Kasler Morris Lantern. 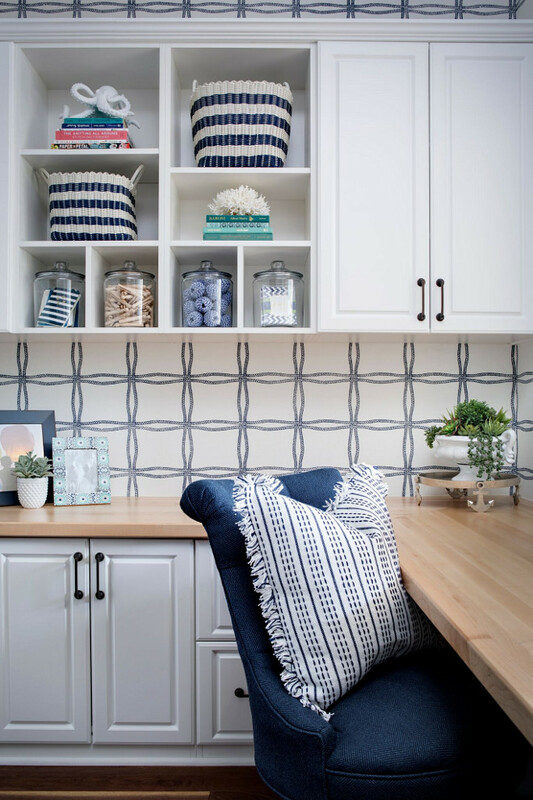 Gorgeous craft room with built in cabinets and a nautical blue and white wallpaper. Wallpaper is Phillip Jefferies – Why Knot in Navy on White Paperweave. Chair is Ballard Designs. Pillow on Chair HomeGoods. 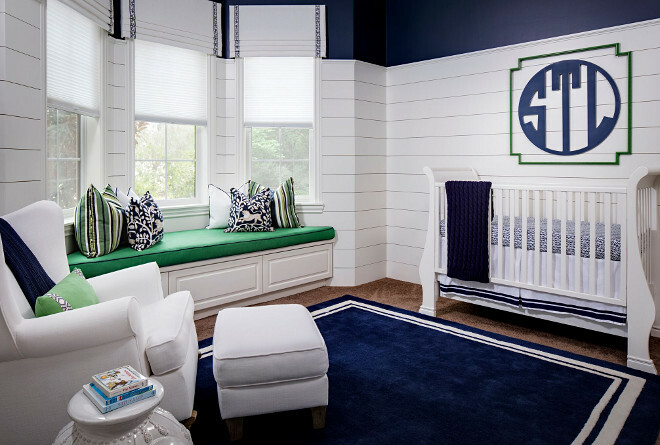 Nursery features shiplap paneling and window seat with storage. Rug and Rocking Chair & Ottoman are Pottery Barn. 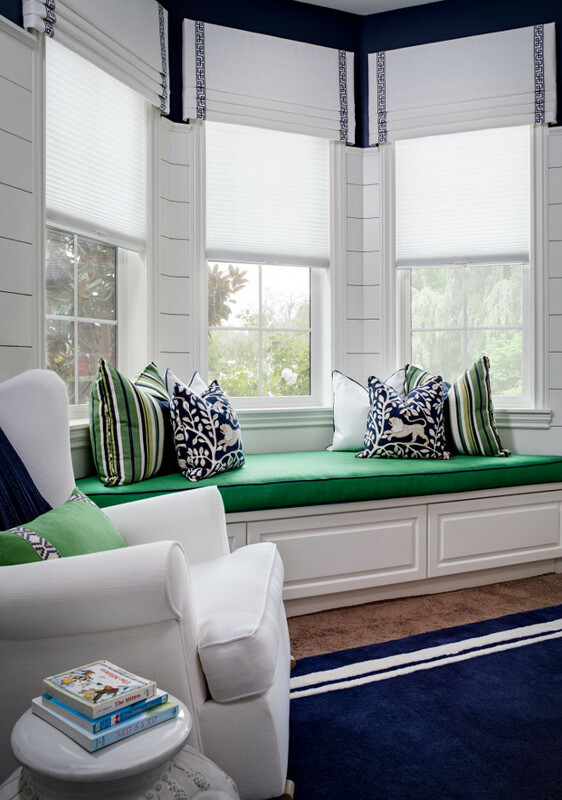 Window Pillows: Custom using Duralee & Robert Allen Fabrics. 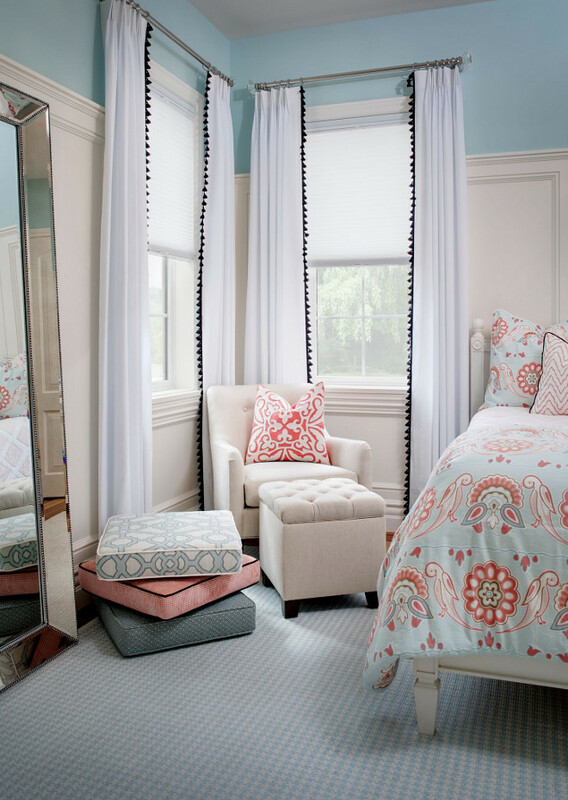 Window Valances: Kravet & Lee Jofa. 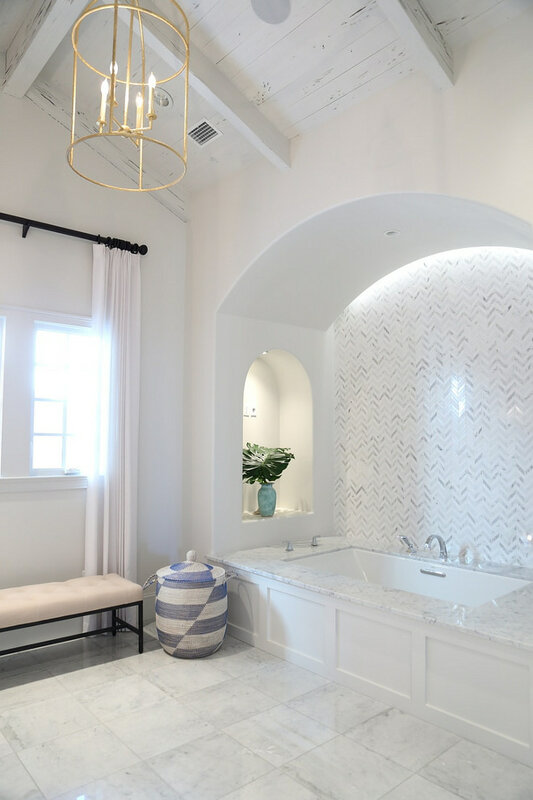 Arched bathtub nook with marble herringbone backsplash tile. Ceiling features rustic Pecky Cypress wood. Paint Color is Benjamin Moore White Dove. Basket is Serena & Lily. 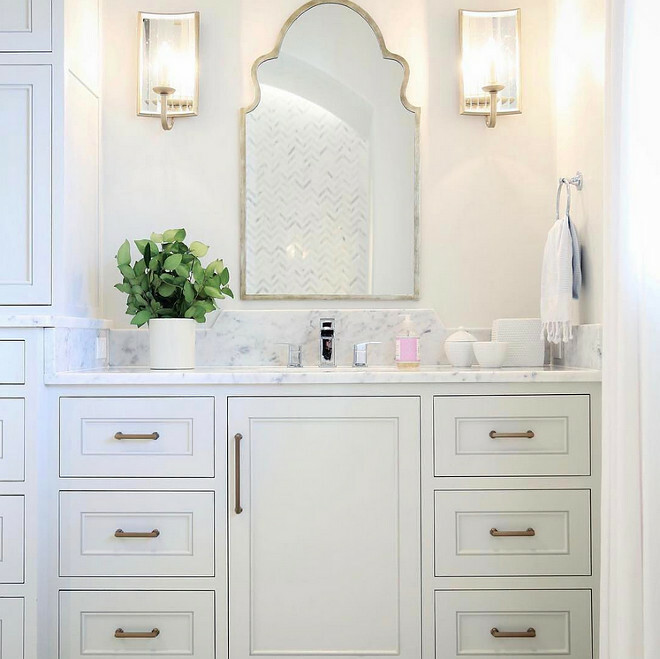 In this bathroom, a Moroccan mirror add gorgeous curvilinear shape and shine in combination with the antiqued mirrored sconces. 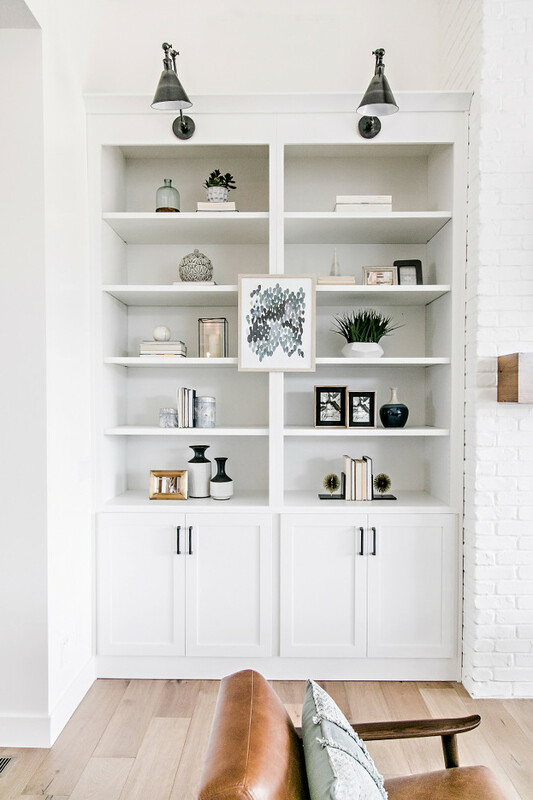 White Cabinet Paint Color: Benjamin Moore Simply White. 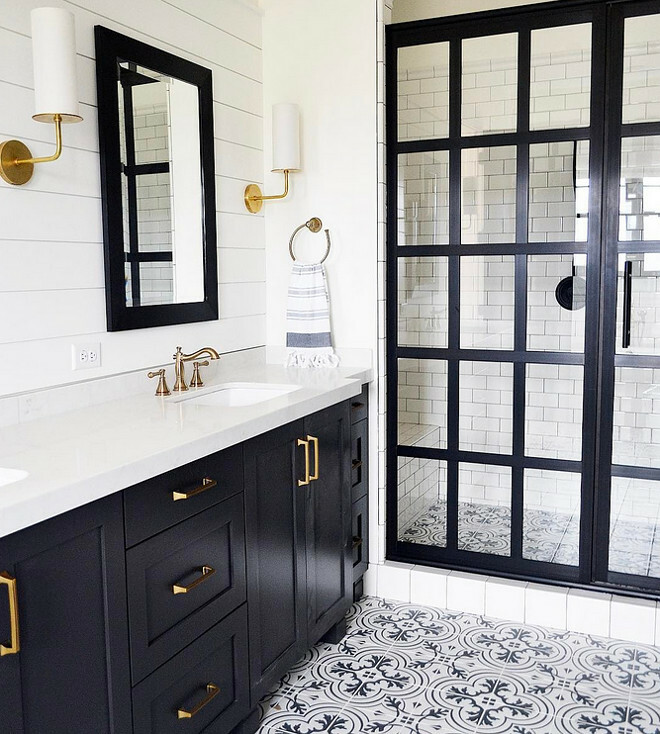 Modern farmhouse bathroom with black framed shower doors, black vanity, brass fixtures, shiplap paneled wall and cement floor tile. 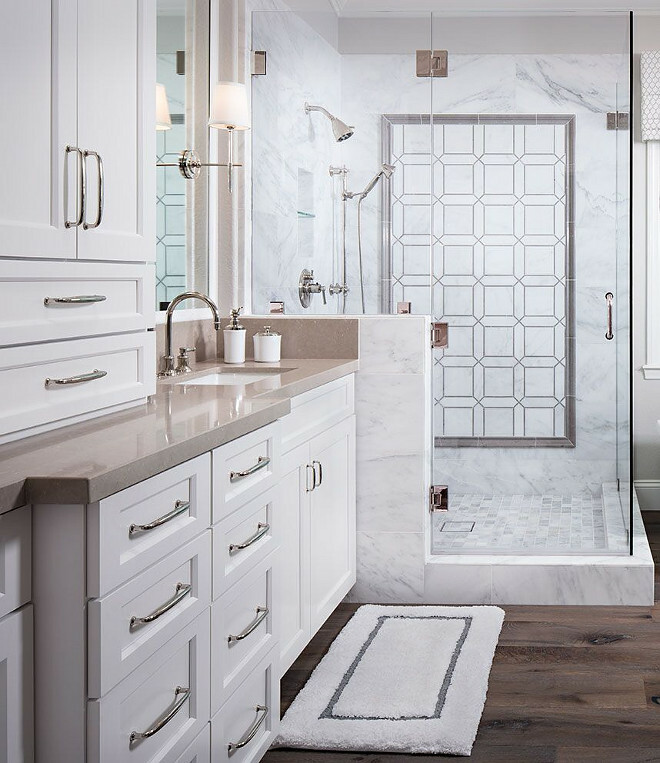 Beautiful bathroom with neutral elements. Countertop is Cosentino and the shower tiles are Asian Carrera Honed. 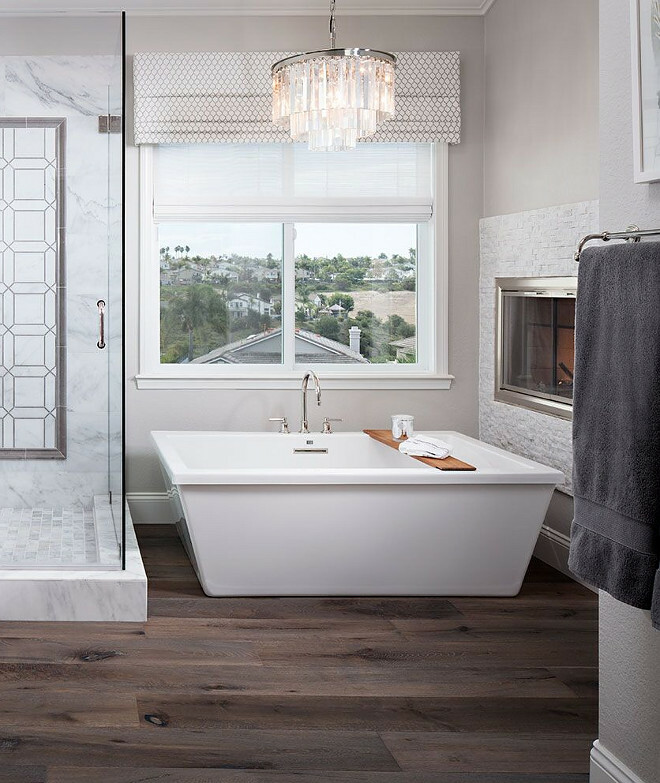 Faucets & Shower Fixtures: Pirch – California Faucets. Bathroom flooring is Oak Hardwood Flooring – Provenza Pompei Vesuvius. The tub chandelier is Restoration Hardware – 1920’s Odeon. Tub is Pirch MTI Whirlpools. Window treatment is Maxwell and the fireplace tile is 1 x 2 Rock face white marble mosaic. Rug is Pottery Barn; Bosworth printed wool rug. Chandelier is Restoration Hardware Crystal Halo. This bed was custom made by OHM3 using fabric from Kravet (29484-11) but you can find similar looks at Restoration Hardware. 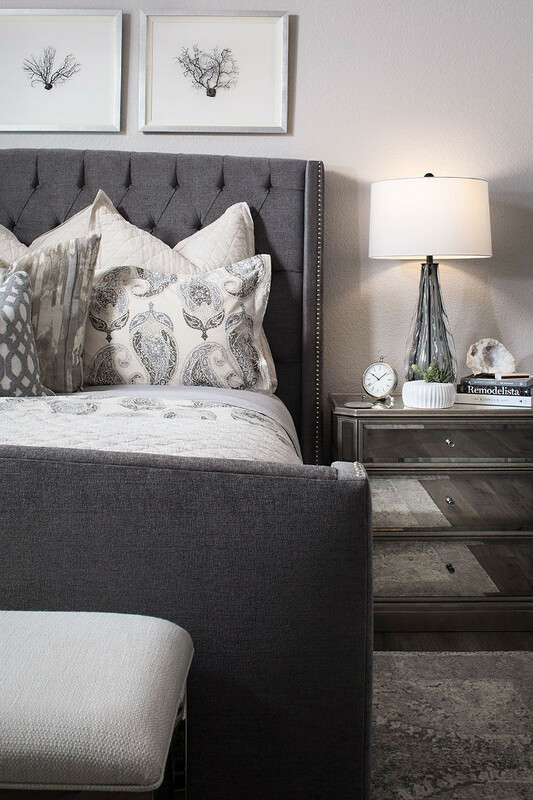 The nightstands are Restoration Hardware – 1930’s French Mirrored 32”Nightstand – similar here & here. 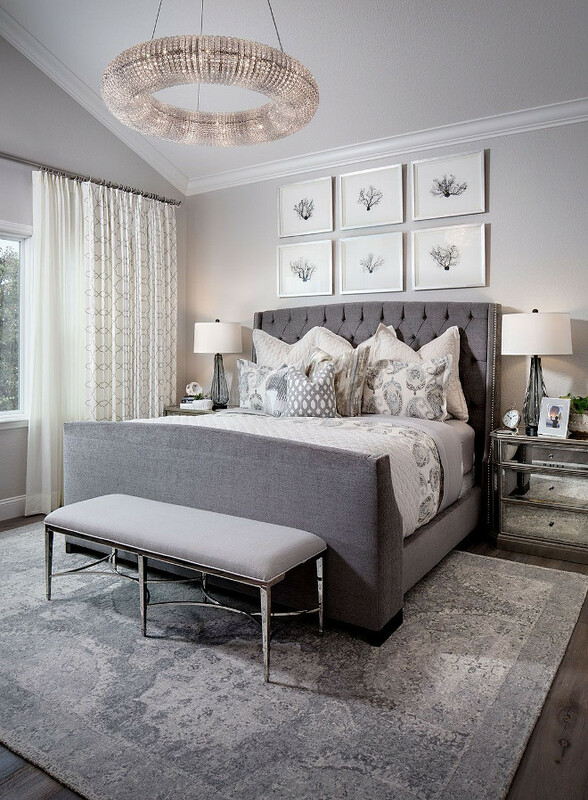 Neutral bedroom with separated sitting area. The bedroom draperies are Serena & Lily. Bedding is Annabel Duvet Cover also from Serena & Lily. Rug is Dash & Albert. Floor Pillows: Custom using Duralee fabrics. Chair: Pottery Barn. Pillow on Chair: Home Goods. 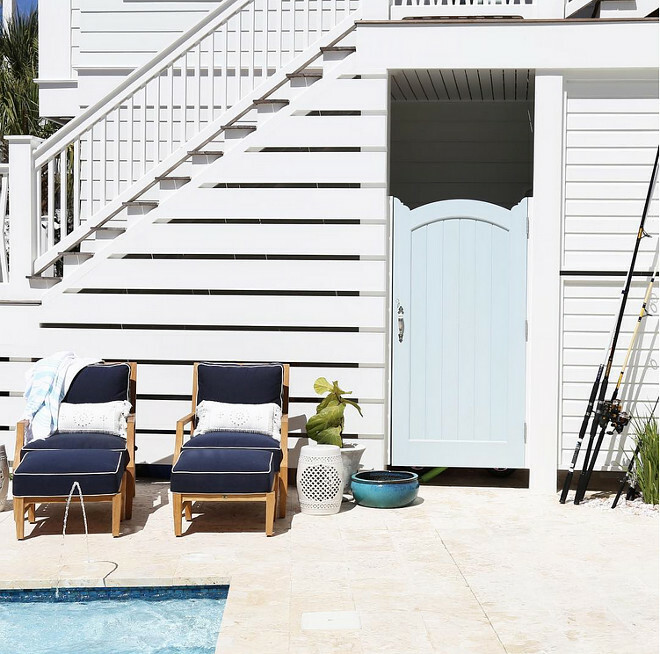 Poolside outdoor shower and storage under the deck. 10 Most Popular Paint Colors: Cotswold AF-150 Benjamin Moore. Coventry Gray HC-169 Benjamin Moore. Crushed Ice SW 7647 Sherwin Williams. Dovetail SW 7018 Sherwin Williams. Sea Salt SW 6204 Sherwin Williams. Lazy Gray SW 6254 Sherwin Williams. 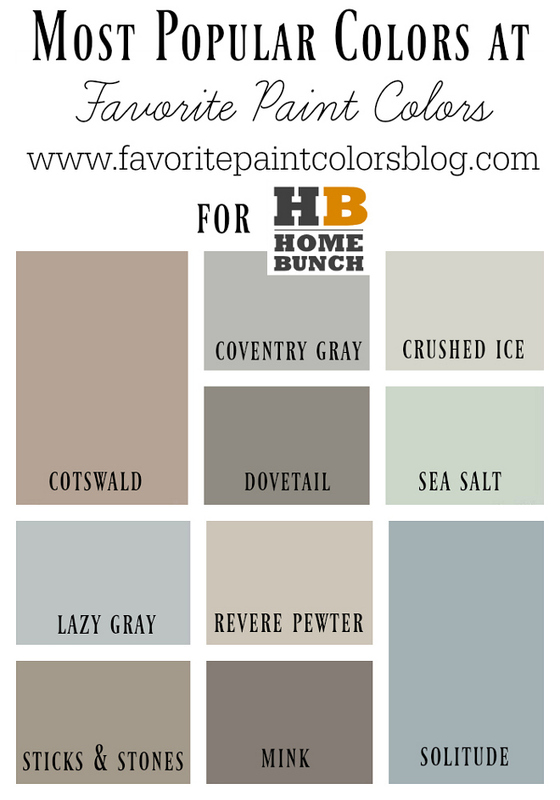 Revere Pewter HC-172 Benjamin Moore. Sticks and Stones SW 7503 Sherwin Williams. Mink SW 6004 Sherwin Williams. Solitude AF-545 Benjamin Moore. 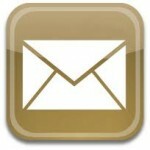 Just wanted to let you know how very much I truly appreciate your blog. I am planning on renovating a 1902 home and have gotten so many wonderful ideas from your posts. It has made my life so much easier to be able to show the architect exactly what I want from my pins. 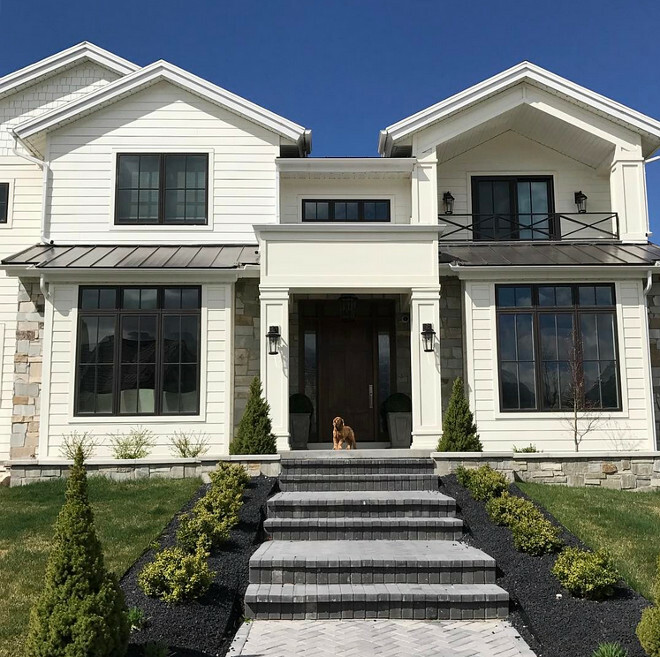 Thank you for posting such amazing homes and sharing all of the links with product info. You have been invaluable!!!!!!!!! This means so much! Thank you for taking the time to write this.